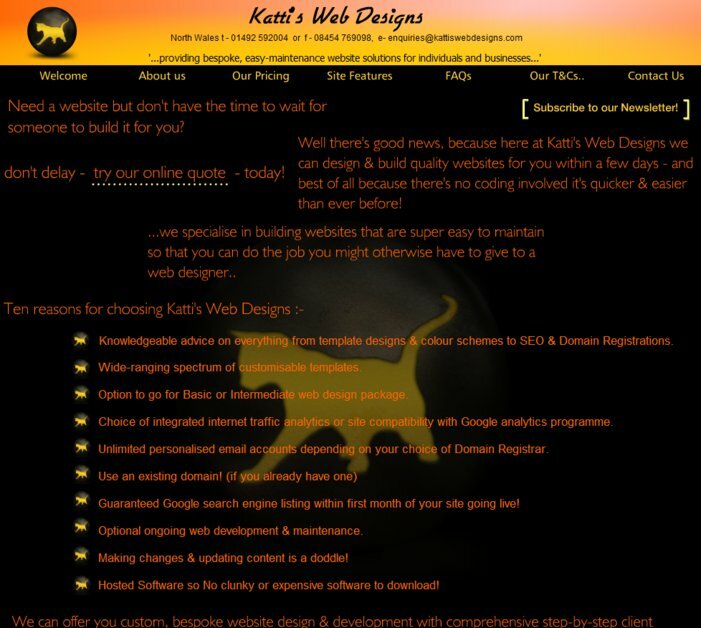 Katti's Web Designs is an innovative business offering bespoke yet affordable easy-to-maintain, non-techie website solutions to clients throughout North Wales and beyond. Fundamental to our belief is that as an individual or business you should not have to employ a third party to run your website for you if you don't want to. We strongly believe in the huge benefits of an owner-update system & the potential savings that can be made. And..we also believe that you shouldn't have to resort to crappy ineffectual freebie templated websites to achieve that autonomy. We are unusual in that we specialise in building clients websites that they can maintain & develop themselves whilst still providing a management option for those who prefer it. Because we largely work in Flash & with software that supports the building of non-html websites we like to think that our service & end product is more accessible to the general public and because elements of our software do also support html coding - clients don't miss out if they need specific coding, widgets or APIs etc. Our clientbase is largely SME's & start-up businesses but we also work with individuals & established businesses wishing to enhance their online presence. We continue to build strong relationships with our clients & provide them with tech support for problem-solving and work-arounds. Concept & Design: Consultation either by phone/email/ face-to-face where we will listen to a clients wants & needs & create a solution specific to them. Ongoing Consultation: Periodic updates via email on how the project is proceeding & invitations for the client to feedback to us. Completion & Instruction: Presentation & walk-through of final website accompanied by detailed instruction to owner on managing their own website if required. 	Comprehensive but Straight Forward Content Management System. 	Front-end editing/updating by client or us. 	Use & Optimisation of royalty-free images. 	Search engine friendly website. 	SEO & Search Engine submission as standard. 	Reliable & Secure hosting of your site. 	Multiple email account configuration for your website. 	Ensured Website compatibility with most browsers. ..and we grant clients UNLIMITED site revisions as we realise how important it is to have this freedom to get things just right. We can create websites designed to be one-offs, static websites or websites that will need further development and can facilitate the process of website maintenance by the client if desired. We can incorporate blogs, social networking & forums as well as e-commerce & data capture into a website. I'm very pleased to be here on Haystack & look forward to opportunities to work on some more interesting projects..
We are currently accepting new projects so please get in touch!